Catherine could be a poster girl for the Green Prescription. Since being referred by her GP in early 2012, she is well on her way to reaching her goal weight –she has achieved this by making changes to her diet and making exercise a priority. Dieting isn’t a new word to Catherine Dally –she attempted and been successful in losing weight previously, but inevitably she’s gained it all back…and then some. In early 2012 Catherine was working long hours and the erratic schedule was playing havoc with her weight –she didn’t have time to exercise and had developed poor eating habits. She heard about the Green Prescription programme and requested her GP to refer her. Catherine says the support she has received from Sport Gisborne Tairawhiti’s Active Health team while on the Green Prescription has been a contributing factor to her success “Wai ringing every month to see how I was going motivated me to ensure I have something positive to tell her”. Catherine said a major benefit of being on the Green Prescription is the access it’s given her to local fitness providers at discounted rates –she immediately started going swimming and to the gym. The impact was immediate and Catherine realised quickly that improved health wasn’t just about diet but also about activity and she decided to get serious. At first it was just gentle exercise in the pool and gym, now Catherine has discovered a passion for hiking –she has already walked the Te Kuri walkway, Cooks Cove, and Mount Hikurangi (unfortunately the clouds came in too quickly for Catherine to reach the summit –she’s keen to attempt again soon). To fully understand the journey Catherine has been on, one only has to look at where Catherine has come from – in 2008 she weighed in at 125kg; today, with the support of GRx, Catherine is down to 83kg. 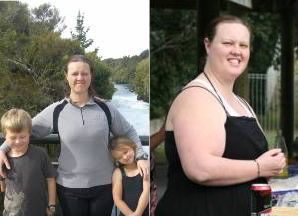 Catherine says her efforts have impacted her family as well – her partner has lost weight because his eating habits have changed; and her partner and children have joined her on a number of hikes.